“Bagrock” is a term that has been coined to describe the sound of the Red Hot Chilli Pipers, a band featuring those most traditional of Scottish instruments, bagpipes and snare drums. Another term that has been used is “Jock and Roll”! 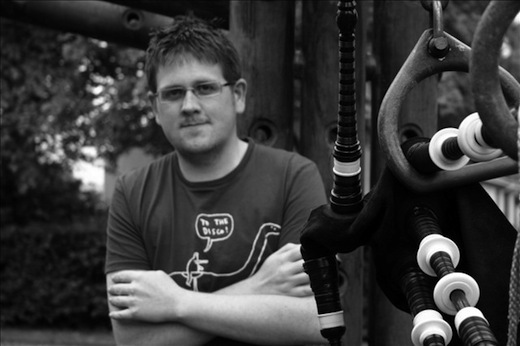 With a new Red Hot Chilli Pipers album, Music for the Kilted Generation, about to be released, I caught up with Lorne MacDougall, himself one of the most exciting pipers on the scene today, about his collaboration with the Chillis, and his own solo debut, Hello World. DS: Tell me how you first got involved with the band. LM: The Red Hot Chilli Pipers started when I shared a flat with their front man while he started the band, Stuart Cassells. I spent 4 years at the RSAMD with Stuart and worked on a few projects with him when there so we were constantly exhanging musical ideas. I think the name came about when his girlfriend accidentally filed a Red Hot Chilli Peppers CD amongst his piping CDs when doing a flat tidy. She thought it was Red Hot Chilli Pipers! I’m rarely involved playing much with the band, but helped out lots when they began to expand their repertoire beyond Scottish and pipe band favourites. When they won BBC 1’s When Will I be Famous back in 2006, they were offered an album from REL, who are a great Scottish record company. So myself and Stuart quickly got planning the material from it. DS: How would you describe the band, to anybody who hasn’t heard them? LM: The Chillis specialise in entertaining, fun, feel-good music. It’s a unique set-up, connecting pipes and rock music as well as hinting at many other styles, but having three bagpipers and drummers as the key ingredient. The set ranges from rock and pop covers to classical to traditional pipe music and more. DS: You used Sibelius on the Pipers’ new album. What part did Sibelius play in the creation of the album? LM: Sibelius completely changed the ways we harnessed ideas. In the studio, there was always a laptop on with a Sibelius score on it for quickly working out harmony parts and so on, but prior to entering the studio, Sibelius was invaluable. From the very first days of flirting with ideas, Sibelius was by our side. We had a lot of simple arranging to do first – working out what keys and octaves would suit certain tunes and riffs, then working on more traditional pipe embellishment and harmonies to go around them. Sibelius revolutionised how we worked out parts by allowing us to actually write Sibelius scores alongside live performances through ReWire in Adobe Audition. It gave us complete freedom to improvise, edit it to what we liked, then transcribe alongside it. We could even do it for Highland bagpipes which are, awkwardly, scored a semi-tone below what is actually sounded on them. There is even software out there that allowed us to use a proper bagpipe sound with the Sibelius notes, giving us an accurate representation of how it would sound. DS: Some of the notations used in pipe music are unusual. Can you tell us anything about them? LM: Well, as the sound from the pipe chanter never stops, definitions between notes are made using solely grace notes. These can be single grace notes or up to seven or eight joined together. Certain groups of grace notes have names, such are birls, throws and crunluath. Rhythms in pipe music are often expressed through grace notes, and a triplet on another instrument maybe substituted as a birl or tarluath on the pipes. DS: Do you have any tips to share with other Sibelius users who are interested in writing for pipes or other traditional instruments? LM: Typeset a tune, then spend some time on the layout of it until you are happy, then save it as your Trad house style. Play around with staff sizes, grace note sizes, margins etc. It’s easy to lose the items that are uncommon in trad music like bar numbers and instrument names this way. Once you have a nice-looking score, you can apply that style across all your future scores via house styles, or even save a template. I tend to start most of my Sibelius sessions with a simple, two-bagpipe score. DS: What’s next for you and for the Pipers? LM: Well, now the album’s done I’ll probably leave the Chillis to do their own thing. They’ll be touring the album from October onwards. I’m focusing mainly on getting out with my own band performing material from my solo album, Hello World. It’s released shortly after the new Chilli Pipers one. We should be having our first proper gig at Celtic Connections, in Glasgow, 2011. A book is also on the way featuring music from the Chillis as well as the more traditional stuff that myself and Stuart have recorded. It’s done in Sibelius, of course, and should be out nearer the end of the year. DS: Tell me about your own new album. When does it come out, and where can people buy it? LM: My new album is very much the album I wanted to make. It’s mostly progressive styles of piping – use of notes outside of the standard piping scale, uncommon performing techniques, multitracking, some electronic effects, and a good group of accompanying musicians. I can’t really pigeon-hole it into a particular style, but there are hints of rock on some tracks, some are typical folky piping tracks, some sound a bit classical and some completely unique. There’s a mostly improvised Lament with the British guitarist Martin Simpson along with Highland pipes which I am particularly proud of. It’s released on 1st November on Greentrax Recordings and is available from my web site, MusicScotland.com and most record shops with a specialist folk section. Thanks to Lorne for taking the time to talk to me!